Green Park Co., Inc. started out like a lot of great rags to riches stories. Back in 1967 Robert Leo Sr. installed his first irrigation system in Clark, NJ out of the trunk of his car. Fast forward 50 years and Green Park has grown into a major irrigation firm in New Jersey with more than 15,000 sprinklers systems installed throughout the state. As far south as Toms River and far north as Mahwah on the NY border, Green Park has installed and serviced sprinklers systems in almost every town in between. Our work consists of residential installations/service, commercial installations/service, municipal installations/service and even some rooftop installations along the Hudson River. Servicing Union, Essex, Morris, Middlesex, Hudson, Bergen, Passaic, Hunterdon, Warren, Sussex and Monmouth Counties – Green Park has customers in over 150 municipalities. Green Park on an average year installs enough pipe that if laid straight end to end, would almost stretch the entire length of the Garden State Parkway (172 miles). We install over 10,000 sprinkler heads each year, which could fill a 18-wheel tractor trailer. Installing hundreds of irrigation systems every year and working with dozens of landscapers and builders throughout northern and central New Jersey, Green Park and their umbrella man logo has become a recognized symbol of quality and commitment to service for its customers. Today, after 50 years, Robert Leo Sr. is still as passionate about the business as he was in 1967 and is helped by his 2 sons, Robert Leo Jr. and Paul Leo in running the company. 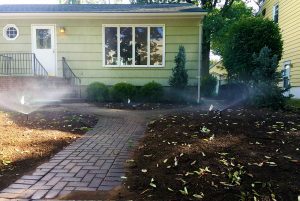 If you are interested in having us give you an estimate for a new sprinkler system, or need immediate service or repair to your existing lawn sprinkler system, please reach out to us at 908-241-8198.